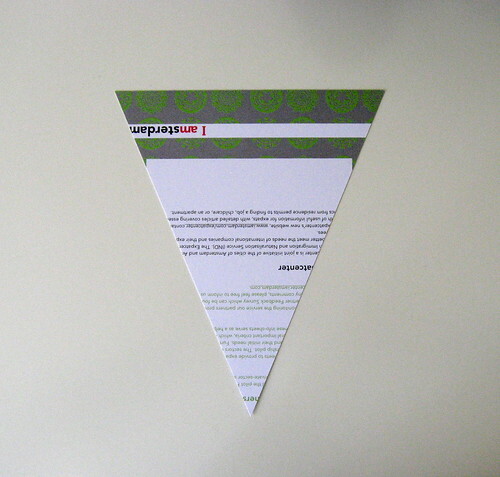 I made some bunting not too long ago and took pictures of the process. 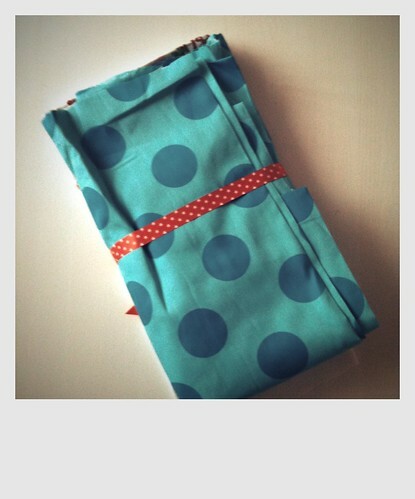 So here is a tutorial for how to sew some for yourself. 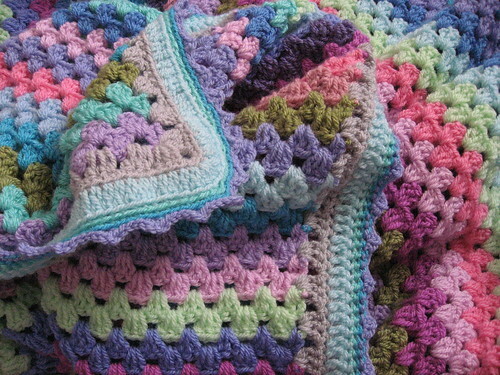 It's pretty, it's easy, and it's great if you have lots of small bits of fabric from other projects that need using up. I made a template to trace out of some scrap cardstock I had laying about. Don't forget to include seam allowance (1/4" on each side). I used the following method: Draw a line of the width of the flag. Find the middle and draw a line down for the length, forming a T. Draw lines connecting the ends of your lines to make your triangle shape. Of course, you don't need to limit yourself to triangles. 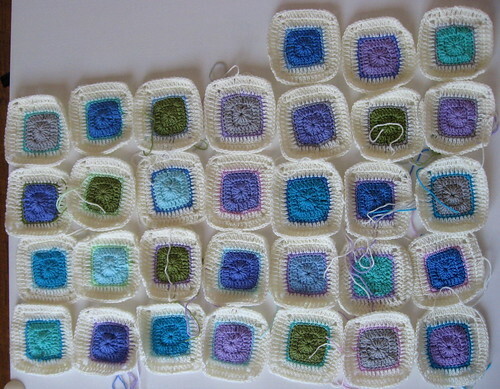 Scallops or squares are also fun. Cut out pairs of triangles in a variety of fabrics. You can either trace the template onto fabric with a washable fabric marking pen or pencil or cut around it carefully, like I did. 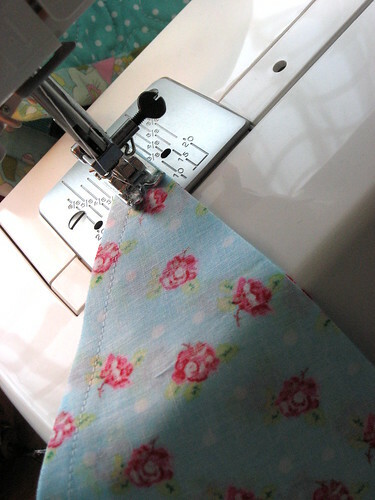 Sew each flag with 2 pieces with right-sides together, leaving the top edge open. Trim your seam allowance with pinking shears to make it less bulky. Then flip it right side out, using a blunt knitting needle (or similar object) to poke the point out. 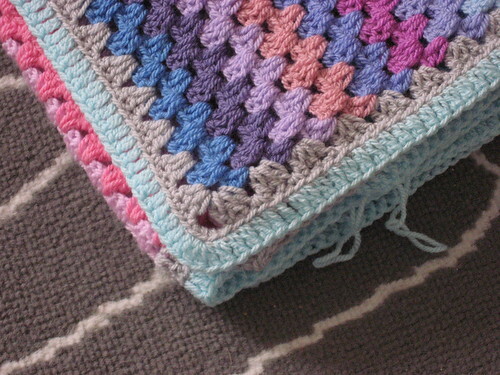 The raw top edge will be hidden when you attach it to the bias tape. For beginners, you turn at the point as follows: stop sewing with the needle down through the fabric, then lift up the presser foot and rotate the flag, then put the presser foot back down and continue sewing. Alternately, you can sew your flags right sides facing out and then edge with decorative bias tape, or trim with pinking shears or do a zig-zag stitch to prevent fraying. Pin your flags inside the fold of the bias tape, then sew along the open edge of the tape to attach the flags. Ta-dah! 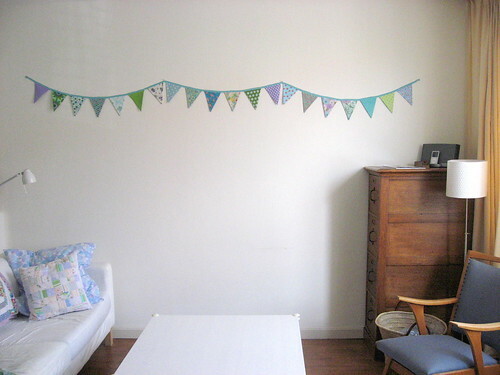 Here's my bunting hanging in our living room. 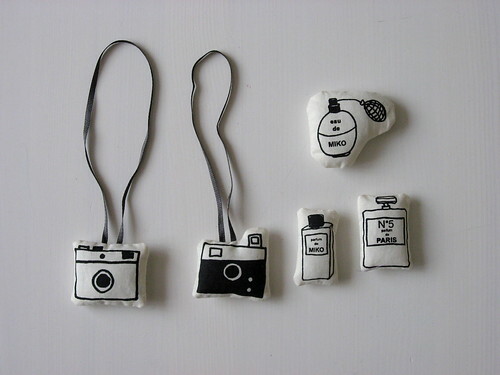 If you make some bunting following this tutorial, please share your pictures in my flickr group! I'm so excited to work on my next project. I'm doing a makeover of one of these. It's made with hideous material, but it's a fantastic shape and size. I was inspired by seeing this one. 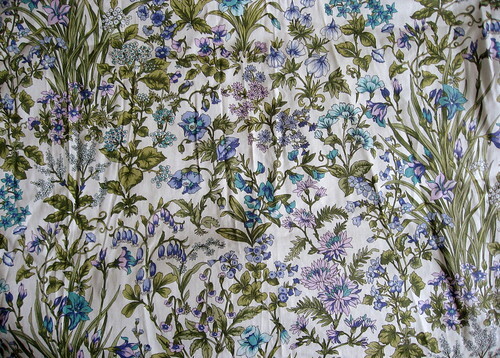 I plan to use the fabric pictured above, with accents inspired by this patchwork. I made the Wee Lass a dolly! I used the cute "I love Paris" doll kit by Miko Design that I saw in a Dutch magazine. We named her Gabrielle. 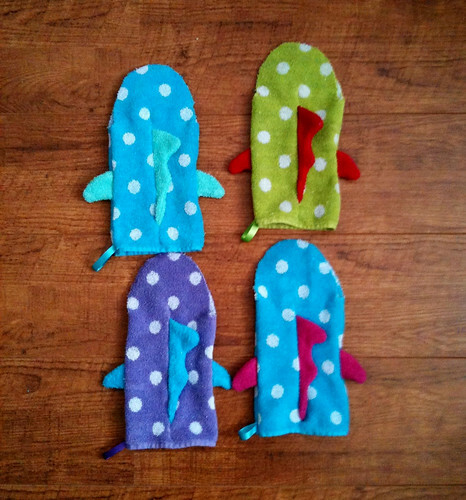 It was really a quick sew, including all the little accessories. These are set aside until the Wee Lass is a little bigger. 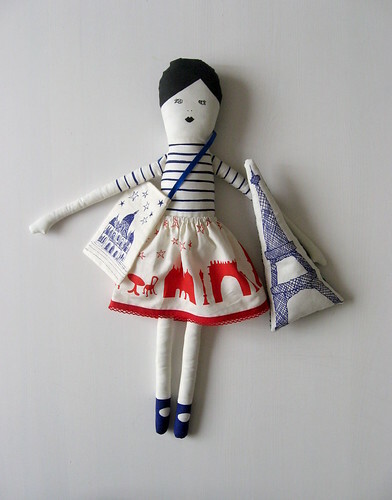 For now she has her Eiffel tower and souvenir bag. We also like to use some of our play food, in particular this wooden chèvre. A fun discovery was how easy it is to make an elastic waist skirt. I already have plans to make some skirts for the Wee Lass come spring and summer. I found an old curtain at the thrift store yesterday. It won't stay a curtain as we don't have any windows the right size, but I loved the fabric. It's been awhile since I've found anything for me, though my thrifty luck (and persistence) has been providing splendidly for the Wee Lass (from clothes, to shoes, to toys). There's a ton of fabric in the curtain, but I figure some will end up as a cushion cover or maybe part of a patchwork slipcover for a thrifted armchair. More travel of late. We went to London in September and Barcelona in October. I've been to London several times now, so I didn't take a lot of pictures. 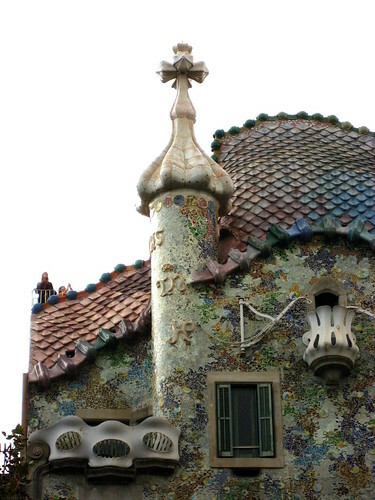 Barcelona was new though, and I filled our camera with pretty pictures of the fabulous architecture. 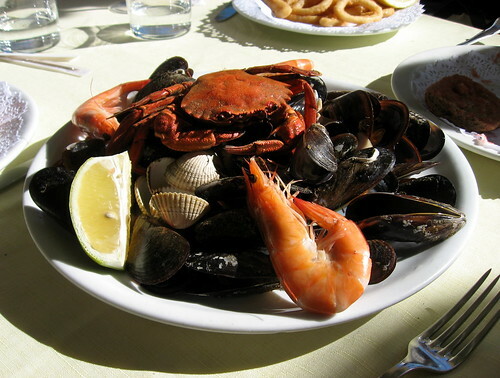 We ate spectacular seafood by the sea, in copious quantities. 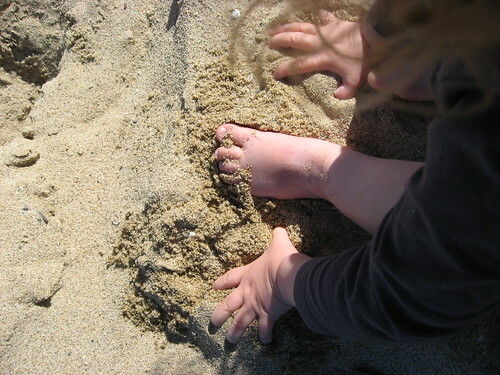 And took the Wee Lass to the beach. It was pretty chilly at the end of October, but we dabbled our toes in the waves of the Mediterranean Sea, because, how could we not? Studio Sundays are still in the mix, but we've also been busy enjoying summer. I started working on a new crochet blanket and I also figured out how to make our laminating machine work. No revolutionary projects from that yet, but I laminated an alphabet card, our "Boots" sign, and a pretend ID card to go in a play wallet. There has also been some more summer holiday travel. 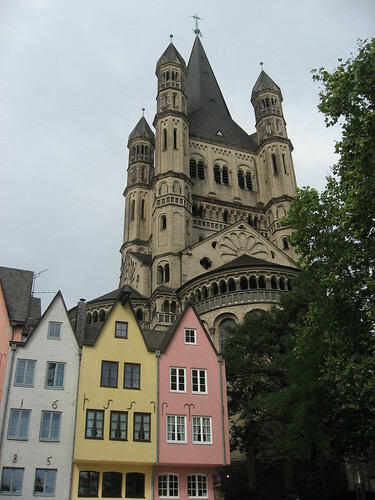 We visited Germany for the first time and had lots of fun exploring Bonn and Cologne for a few days. Today's Studio Sunday was deeply satisfying because I finished 3 things. Two of them had been in progress for awhile and one was completely new. 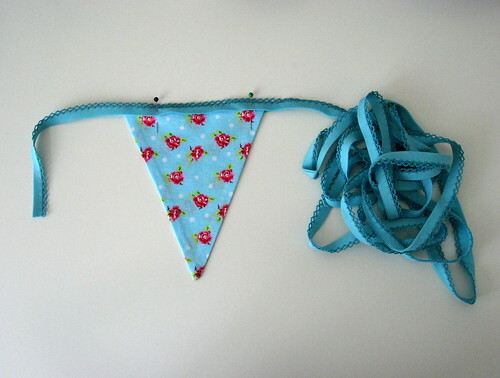 I am especially pleased with the fabric bunting. Our living room is much more cheerful now. I also made a bird garland out of an IKEA placemat for the Wee Lass's room. She was very excited when she saw it, exclaiming "Dida!" (her word for birds). I think it might be cuter if I hung them off of a twig instead of yarn, but this was what I had on hand. I might try some jute twine instead to see if that is nicer, while still being less fiddly than figuring out how to hang twigs securely from plaster walls. 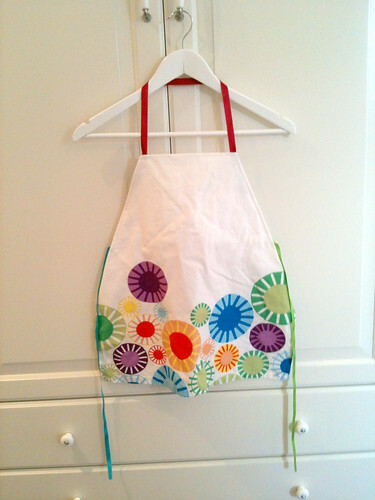 And the item I made from scratch was an apron, also for the Wee Lass, out of an IKEA tea towel. We used it almost immediately as she helped make dinner (her job was helping rinse spinach and transferring it from the colander to the pot). Of course, at 16 months old, it's all still a game to her, and she was keen to then transfer the spinach back into the colander! Studio Sundays have been skipped lately due to a holiday to Canada. 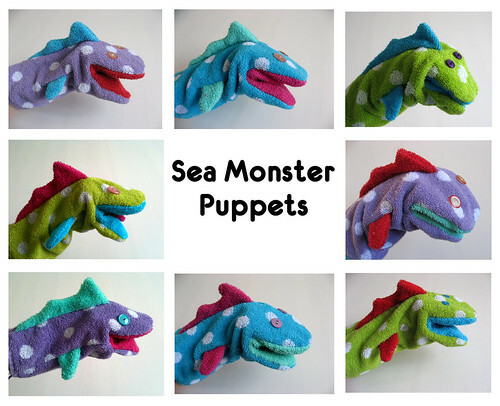 Before going, I made a bunch more sea monsters to give as presents. I've now made 8 in total and they have happily gone off to nibble on assorted babies around the world (several are in Canada, but there's also some in Amsterdam, New Zealand, and the U.K.). This past weekend I worked on my bunting again and finished all the flags, so when I get a smidge more sewing time, I hope to assemble it and have a ta-dah! 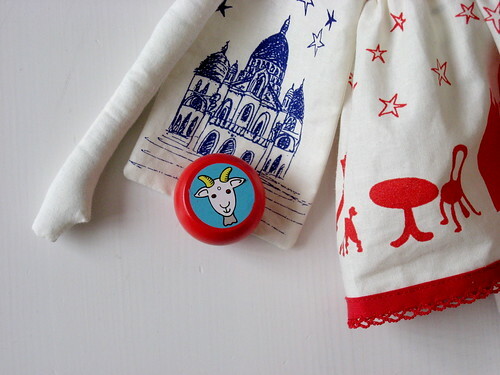 The results of today's time in my studio are a few more flags for my bunting and most of a zippered pouch. Also I did some boring repairs on pyjamas. 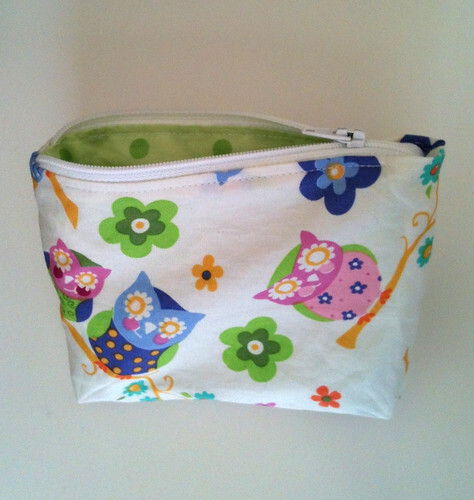 This was my first go at a zippered pouch and my first go with the zipper foot on this sewing machine. It was much less of an ordeal than I'd been expecting. Why do all us amateur sewists have such an irrational fear of the zipper? I've only used them a couple times, but both instances have been pretty easy in the end. I am following this advice for making a zip pouch with neat corners, so I still have some hand sewing to finish it off. This zipper end finishing bit is rather more fiddly than fun. I am tempted to make one the quickie way (just sewing all the way around in one go) and see how it turns out for comparison. If I do, I'll post side-by-side pics of the two pouches. Today's other accomplishments include making and eating (with some help) a rhubarb-strawberry-apple cobbler. Yum! Today was my first "Studio Sunday", also known as "Daddy-Daughter Day". My two sweeties went out to the park and grocery store while I got to have some time on my own to create. 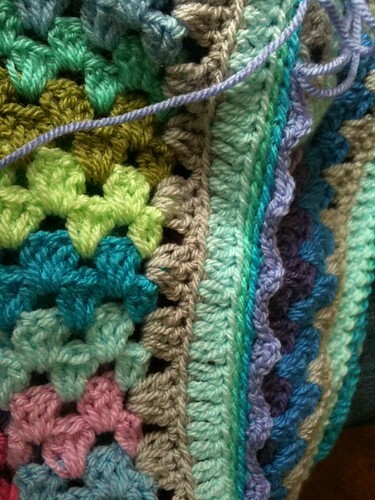 I started a project that I've been thinking about since before the Wee Lass was born.... 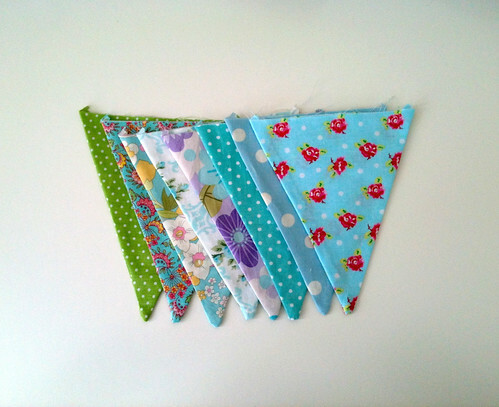 Some pretty bunting. I originally planned to put it in her room, but I think it may end up in the living room. One of the things we couldn't reasonably bring with us overseas was our art, and our plain white walls are looking especially bare since I took down the star garland after New Year's. I still have several more flags to make before I assemble the bunting. It was a glorious couple hours playing with my fabric. The plan is to have Studio Sunday every other week, and I'm looking forward to that time especially reserved for creative pursuits. Laundry is to be strictly ignored! 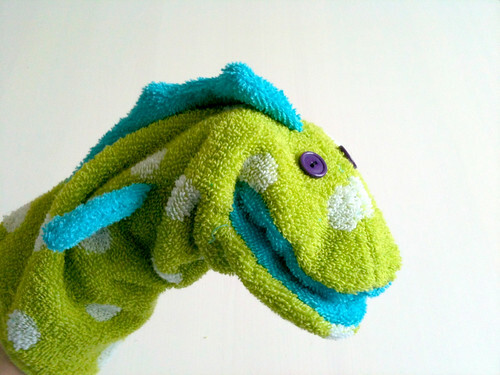 I ran across a washcloth puppet tutorial recently and having just seen some super cheap and fun polka-dot towels at the Zeeman, I had to make one. I ended up scaling up the pattern quite a bit or I don't think it would have fit over an adult hand. This may have been partly due to printing on A4 rather than Letter size paper, but I ended up roughly drawing the pattern again with the paper in "landscape" orientation. If/when I make another one, I will probably switch the seam to run down the side rather than the middle of the head (the dorsal fin could easily be attached in a slit like the other fins). Overall this was a great (i.e. quick, easy, and pleasing) project. I got most of it done while the Wee Lass emptied a bag of clothespegs and happily tried to pry them apart. 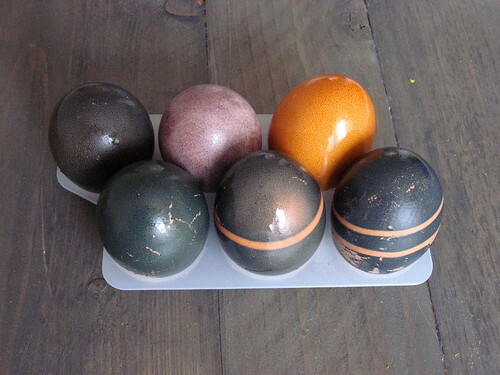 On Easter morning, I threw together some jars of natural dyes for hard-boiled eggs. 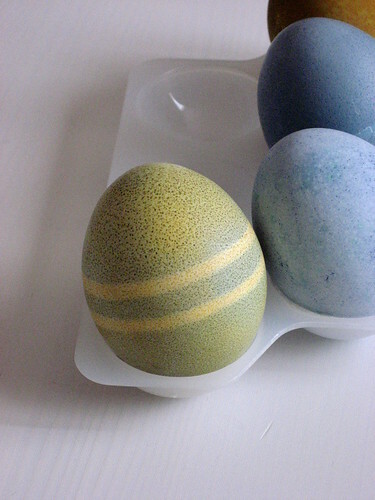 If I'd planned ahead, I would have done it the night before and stocked up on some white eggs, instead of brown. I used cranberry juice, purple cabbage, and turmeric. I got ideas from here and here. 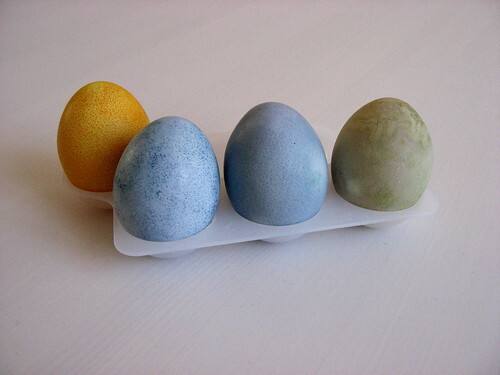 Next time, I think I need to scrub off the eggs before dyeing though, since the dye seems very prone to rubbing off. 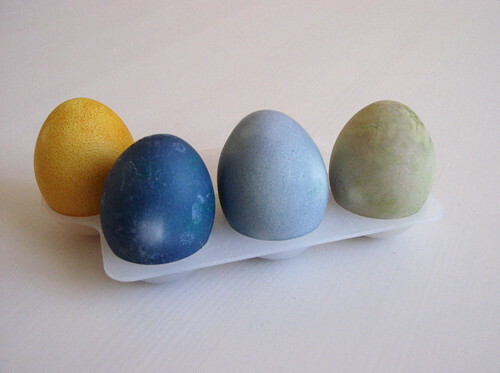 I think the colours would have come out much better on white eggs. 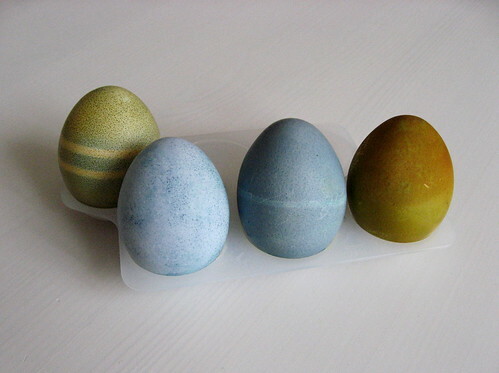 The dark ones are actually a forest green sort of colour, but would probably be a bright blue on white eggs. 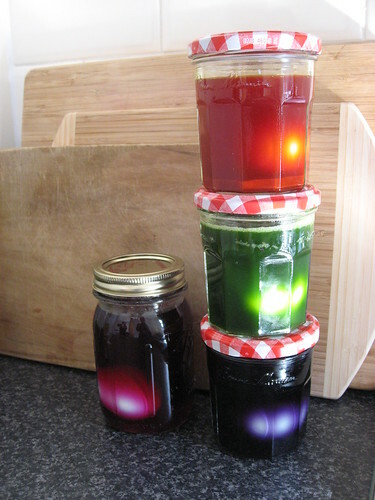 This was so much fun that I may have to do more kitchen science experiments before next year. 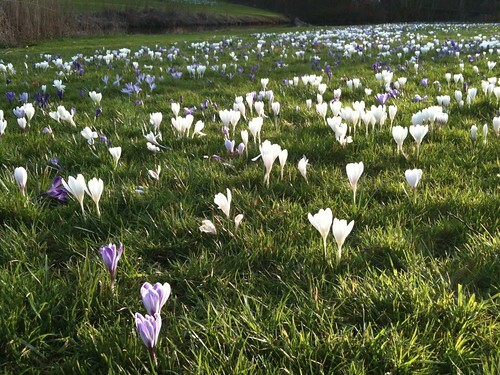 I'm on the last bit of the Spring Cloud Blanket ... the purple picot trim around the very edge of the border. There's something so exciting about that final round. 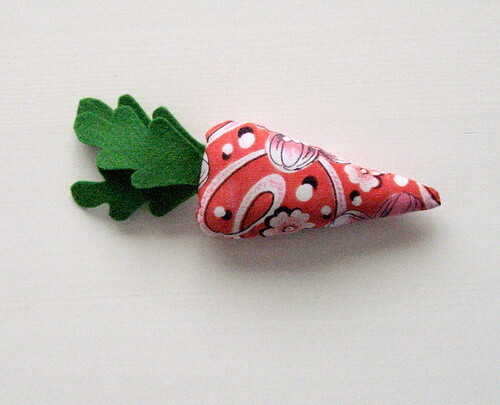 There's a bunny who's been looking for a carrot, so I rooted around my fabric stash and this is the result. 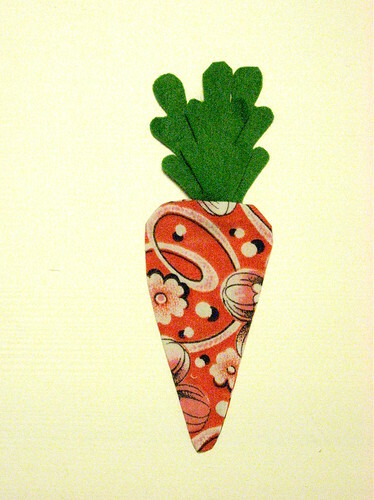 I had no plain orange fabric, but I love the "heirloom variety" carrot that resulted with this patterned fabric. First you need to make your pattern. Draw a carrot shape. Then add some seam allowance by tracing around it a bit larger (however much you want to make your seams). Then draw the leaves. They don't need seam allowance since they'll be made out of felt. This part really doesn't need to be that precise. 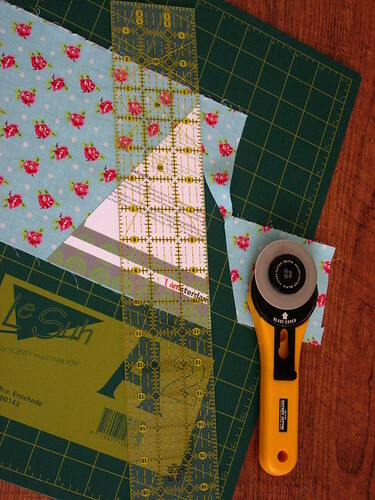 Cut out your pattern and pin to your fabric or trace with a fabric marking pen and cut out. 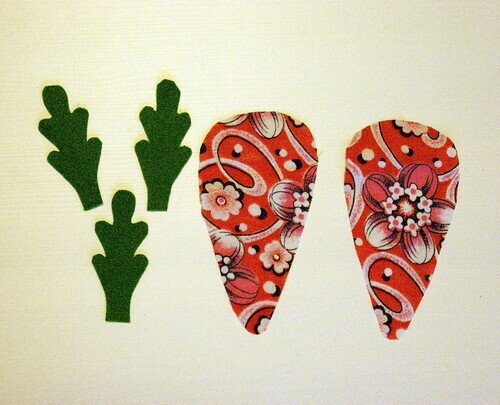 Cut out 2 matching carrot pieces and however many leaves you like. I cut 3 leaf pieces. Mine match, but there's no reason they need to be identical. 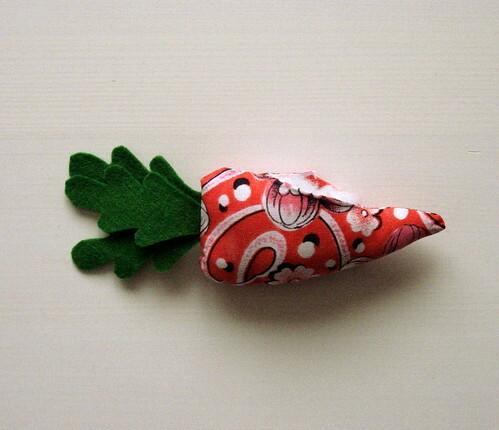 Pin the carrot right sides together with the leaves tucked inside. I always have the wrong instinct to have bits like the leaves sticking out, but then when you flip it, they'd be on the inside. So make sure your leaves are tucked in and be careful to keep all but the stem away from the edges so that you don't catch extra bits when sewing. 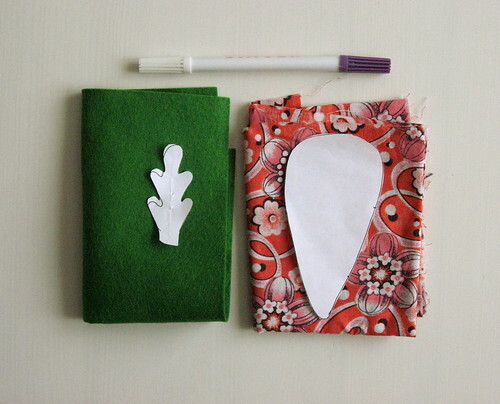 Sew around the carrot, leaving a gap of at least an inch on one side for turning it right side out. I sewed back and forth over the leaves a few times to make sure all three were well secured. Flip your carrot right side out and iron it flat, making sure to iron in the edges of the opening. This makes it easier to sew up later. Now stuff in lots of filling. 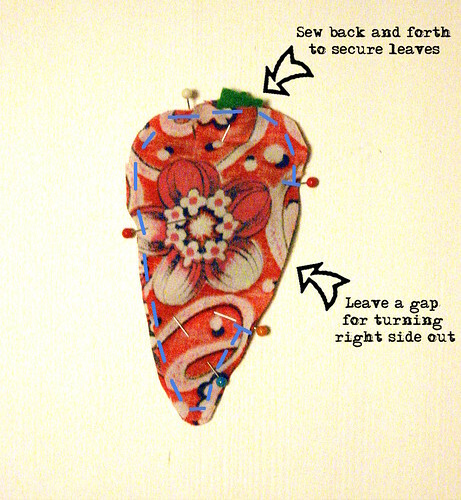 Sew up the gap using a ladder stitch. Voila! The Finished Carrot Toy! 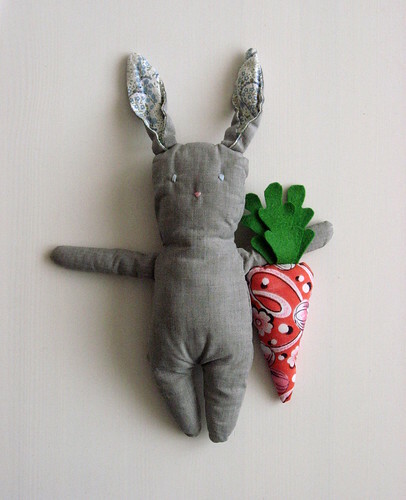 If you make a carrot toy following this tutorial, I'd love to see it! Please add your pictures to my flickr group. The stripes are all done. I'm quite pleased with how balanced, yet random they turned out. 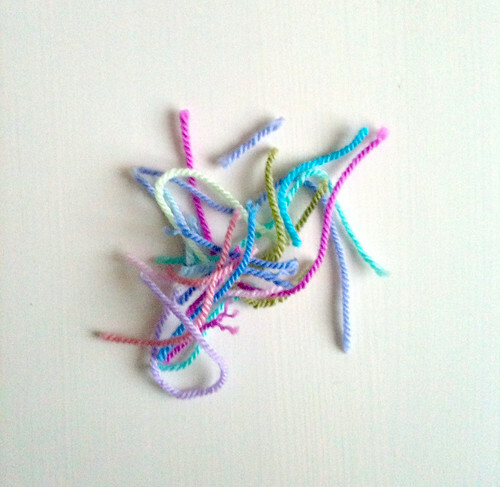 The ends all got woven in and I merrily began the border. About 70% of the way around with the pale blue, I ran out. Ooops. Borders sure do eat up the yarn at a tremendous rate. 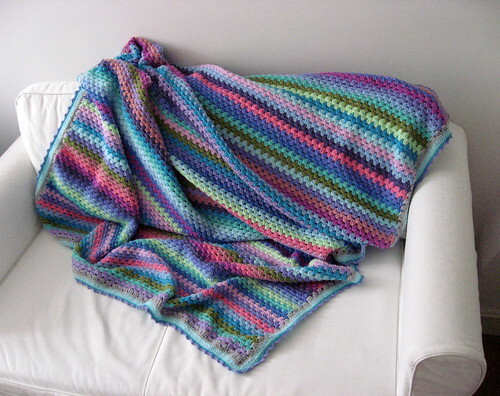 So I've ordered some more of it, along with some of the other colours that I plan to use in the border and which had a skimpy amount of yarn leftover. So far I've done a row of double-crochet clusters and single-crochet in pale grey and most of a row of double-crochet in pale blue. 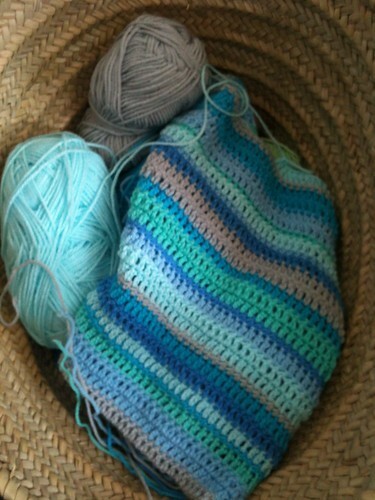 I plan to do some turquoise and aqua single-crochet and then end with some purple. 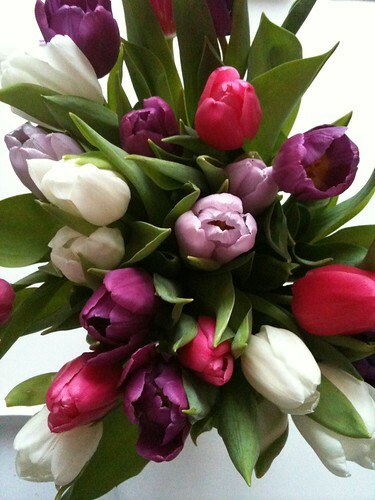 I think I've got enough of the purple left so I didn't order more... we'll see if that was wise or not. 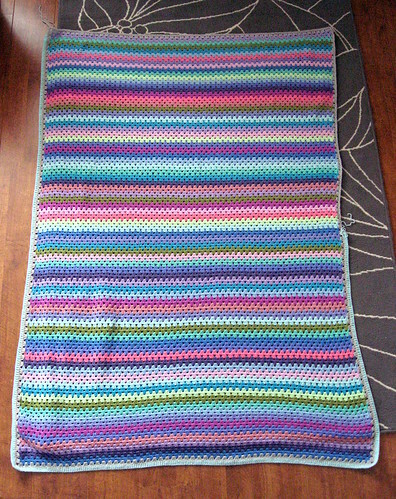 It's now on hold as I'm waiting for the yarn to arrive. I've been rather busy looking after the Wee Lass who has been a bit under the weather, in any case. 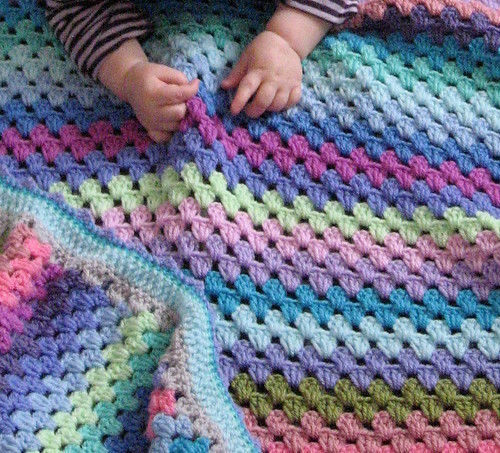 I think I'm still on track to finish the blanket by her first birthday, which was my goal when I started it in the weeks before she was born. 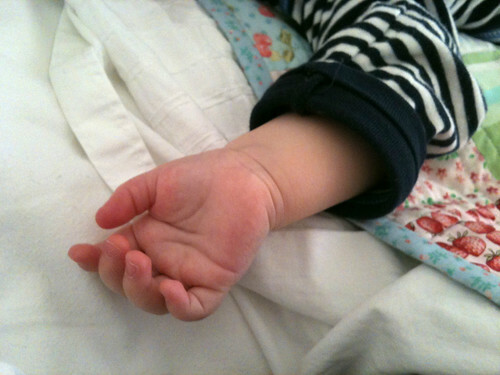 I just wanted to smooch this little hand full of kisses, but it probably would have woken her, so I settled for taking a picture.